Atlanta, GA/1 June 2015- On Wednesday in Atlanta, Motions Hair Brand presented their first ever #MotionsBeautyBar to promote their new Enhance & Define collection. The event was hosted by Bossip.com’s Deputy Editor Janeé Bolden along with Co-Founder of The Cut Life, Tahira Wright. Held at Atlanta’s premier Hair Rock Café Salon, #MotionsBeauty Bar welcomed a host of Atlanta tastemakers and beauty influencers for an evening of pampering. As guests entered, they were greeted with delicious hors d’oeuvres cooked by Chef Petey, complimentary cocktails provided by Ciroc and an array of delectable treats provided by A Haute Cookie as well as Sweet Shot Cupcakes. Mychael “Kells” Michelle, owner of Hair Rock Cafe along with her professional staff, styled and curled the attendee’s hair, leaving everyone looking flawless. The ladies were also treated to beautiful manicures courtesy of UV Nail Lounge as well as the famous brow wax and tint treatment from Candy Brow Bar. 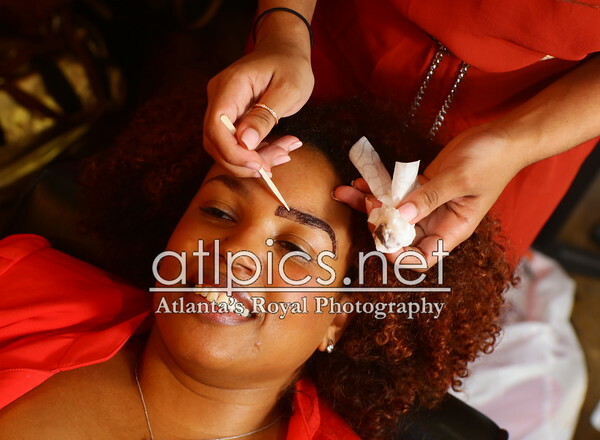 As guests mingled in the salon, they swapped beauty regimens and took selfies showcasing the services. As the night concluded, ladies were able to take gift bags home filled with products from Motions’ Enhance & Define collection. “Since successfully launching our #BeautyBar event series last year, it’s become something Tahira and I look forward to more and more each time we host,” Janeé Bolden says of the pampering event. “When Motions reached out to partner we were so excited to share their new products. With the change in season everyone wants to look their best, what better way to celebrate than getting summertime fine with friends while enjoying great services and ambiance at the same time?” she states. Notables in attendance included emerging singer Marissa, A&R Ray Daniels, April Love, I’na Saulsbery, Christal Jordan, Enyia McCollough and Kristin Buckner.